The EasyPREP Soil Analyzer is a multi-parameter Robotic Soil Analyzer System. The system includes software and hardware to perform pH and electro conductivity measurements in a variety of vessels. Completes tedious environmental testing for uninterrupted operation. Up to 3 point pH calibration and 2 point EC calibration. 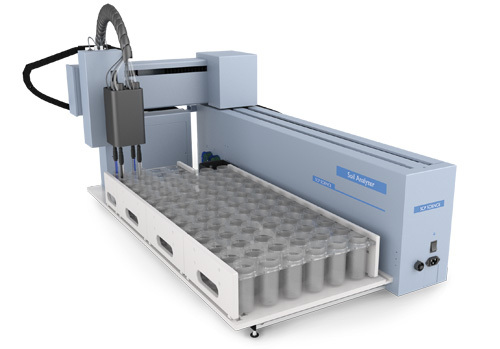 Analyze and mix up to 4 samples simultaneously. System has one temperature measuring probe for each set of up to 4 pH/Conductivity probes. Dual pumps for each pH electrode, one for each reagent. System built to work in a corrosive environment. Housing and components are acid resistant. Stepper motor peristaltic pump with better than 0.5% accuracy in delivery at 1ml. Ability to save and recall the defined Methods for fast setup of routine operations. Preprogrammed methods based upon ISO and Standard Methods, which can be modified and saved for faster programming of new recipes. Barcode reader optional accessory allows sample ID to be loaded quickly. GPS location of the exact sample location can be programmed in the software. Transfer sample ID from other platforms. Quick referencing and tracking of results.